I can’t remember how long I had dreamed of seeing Provence, in France’s southern region, but the moment my husband Mike and I boarded the fastest possible train from Paris to the city-commune of Aix, I was giddy with excitement. I was like a little girl about to get her gift from Santa Claus, knowing very well that she’s getting exactly what she has been wishing for the past several Christmases. 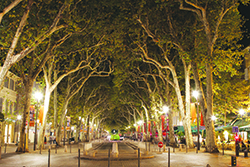 It was the last week of May—the perfect time to visit Aix. Spring is ending; summer is just about to begin. The days are long. A dinner at 8 p.m. has the sun still up. Temperature ranges from a sweet 12 degrees to a comfortable 25. No summer crowd yet, and hotel rates are not yet at their peak. In a few more days, lavender would bloom. We could not have gotten a more perfect hotel—a charming farmhouse estate that’s three kilometers from the city center. It may not be right smack in the middle of Cours Mirabeau, where most of the action is in Aix, but the hotel—Le Mas d’Entremont—was so much of a beauty in itself, it could very well be a destination on its own. The rooms were beautiful, large and comfortable. We had our own patio with lounging chairs. Inside our room was a king-sized bed, a big bathroom with a separate tub, a shower and toilet area, a small kitchen and a surprise extra room upstairs with two single beds! The whole property sits on 3.7 acres, with six suites, two apartments and 12 rooms—all with a private terrace. Almost half the place is a “green” space, with an ornamental lake, pond, cypresses, old trees and sprawling vegetation. The sun hits open space dramatically on this part of the world. It excites me just to think I’m strolling around where the artist Paul Cézanne was born and lived most of his life. After we pulled ourselves out of this charming villa, we strolled around Cours Mirabeau, a famous tree-lined boulevard with cafés, quaint shops and beautiful fountains that has been dubbed by some as Europe’s most enchanting boulevard. 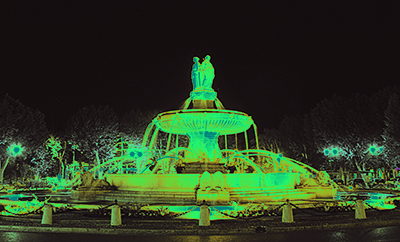 If you search images of Cours Mirabeau on Google, you’ll see enchanting photos of a wide boulevard with equally wide cobblestone sidewalks covered by a canopy of trees, with one massive and dramatic fountain and smaller ones at regular intervals. There were very few cars on this boulevard. It’s mostly foot traffic, with tourists and locals leisurely going about their business for the day. The trees were bare at the time of our visit. It may have lessened the romantic ambiance, but not the enchantment, as the sky there was stunningly blue; the energy, vibrant, but sedate; and the small stylish cafés and shops on each side of the boulevard, charming and inviting. Coming in hungry with not many meals to have in this part of France, we opted for a Michelin-starred restaurant. That restaurant, Pierre Reboul, was just off the main boulevard, but there’s also the petit Pierre bistro that we missed right beside the main dining area. The degustation menu was a feast for the eyes. The texture of the food and the combination of flavors were enjoyable. But for the price, I couldn’t help thinking that the more casual bistro would have been a better choice. It was in Cours Mirabeau that we first tried Amorino Italian gelato, and we fell in love with it. We had lots of it on this trip, up until we reached Barcelona to make sure we won’t miss it when we return to Manila. We were having a grand time until we found out that most shops were going to be closed the next day, a Sunday. This broke my heart, as we were leaving on Monday and had a full day of nothing to do the next day. But, of course, there’s no such thing as nothing to do while in Aix! We searched for a car—it was more difficult than we expected, as all of the three car rentals in the place had run out of cars to rent out! Good thing luck was on our side: Just as we were leaving the last car rental in the area with hunched shoulders and long faces, a blue Peugeot pulled up, with a couple returning it! The branch, however, was closed already. The attendant just accommodated the returning car, and as we looked on, like doggies anticipating their treats, the attendant couldn’t resist putting in a few minutes of overtime to process its rental for us. Dirt and all, we accepted it with open arms. So what if we can’t fulfill our dreams of driving a convertible in the south of France, with my hair blowing in the wind? What’s important was that we had a car! Where we were going, we didn’t know. The next day, Nicolas, the hotel owner who humbly calls himself the front-desk receptionist, had the answer: Lourmarin and Rousillon, which are less than two hours away and are rated as two of the top five best villages in France. Cherie Mercado Santos is a television news reporter and anchor for the last 20 years for the top three broadcast networks in the Philippines—GMA, ABS-CBN and TV5. 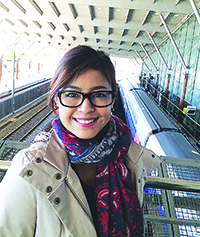 A nature-worshipper, Mercado loves traveling and communes with nature as a way of deep prayer. She is the proud mother of two daughters, Christiana and Anabella, and happily shares life’s journey and travel adventures with her stockbroker-husband Mike Santos.